AS RECOVERY BEGINS, THE DEVASTATION LEFT BY HURRICANE MATTHEW IS MORE DISMAL THAN ANTICIPATED. To see our update from October 6, 2016, CLICK HERE. To see our update from October 20, 2016, CLICK HERE. One week ago we held our breath as Hurricane Matthew bore down on Haiti and other Caribbean nations. Maybe its course would just skim the island, maybe it wouldn’t be as bad a projected, maybe families would be protected. Tragically, it’s worse than we thought. The category 4 hurricane pummeled southwestern Haiti for hours with force winds and a downpour that flattened homes and crops and flooded streets and hillsides. The numbers keep coming in as aid and assessment teams gain access to regions previously cut-off due to the destruction. According to the UNOCHA*, an estimated 2.1 million people have been affected. Currently 1.41 million people - that’s 13% of the entire country - require humanitarian assistance and nearly 62,000 have been displaced from their homes, some from communities that were practically wiped out. Local FH staff have been working around the clock, checking in on the children and families in communities FH is partnered with. For some, it took days to get in due to poor road conditions and further rainfall. VIDEO BY FH STAFF. 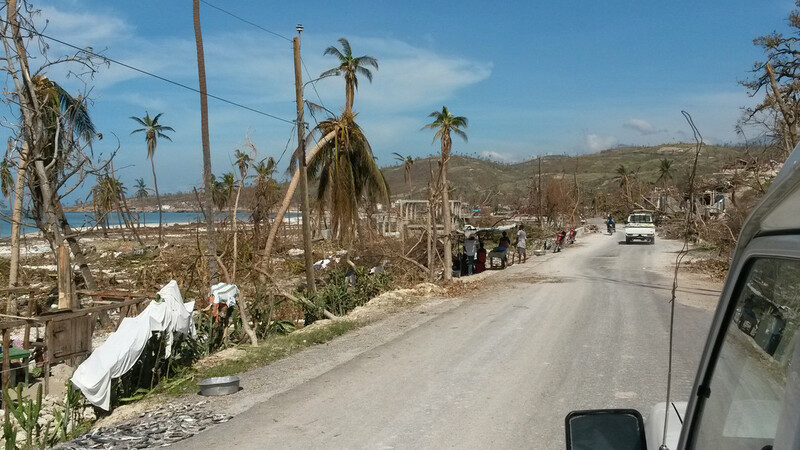 ROAD CONDITIONS THROUGHOUT PARTS OF HAITI ARE NEARLY IMPASSABLE. Staff are returning with hard news; most crops - particularly corn, cassava, and plantain (large-stalk crops) have been completely destroyed. With the harvest season only weeks away, families’ general food stores have been depleted and life will get harder. Many families lost livestock that drowned in the flash floods. CROPS HAVE BEEN DECIMATED, ESPECIALLY IN SOUTHWEST HAITI. Several staff have returned heartbroken as families begin to mourn lost loved ones. In one community, two children were recovered, alive, from underneath their collapsed home. Sadly, their grandmother, who was their primary caretaker, did not survive the accident. In spite of so much tragedy, some good news has come in. FH staff report that all the children sponsored through FH have been accounted for and are safe. 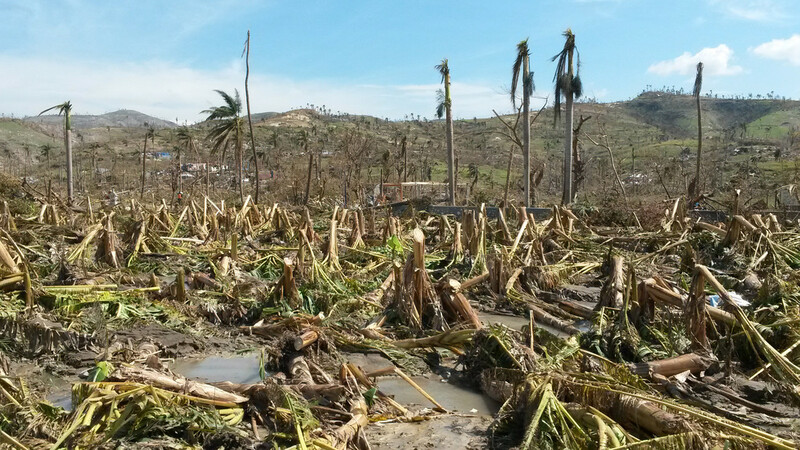 On-the-ground staff also report that the FH Canada-partnered communities of Cachiman and Mategouasse were spared; other than strong winds blowing through the area, there was little to no damage and assessment teams were dispatched elsewhere. 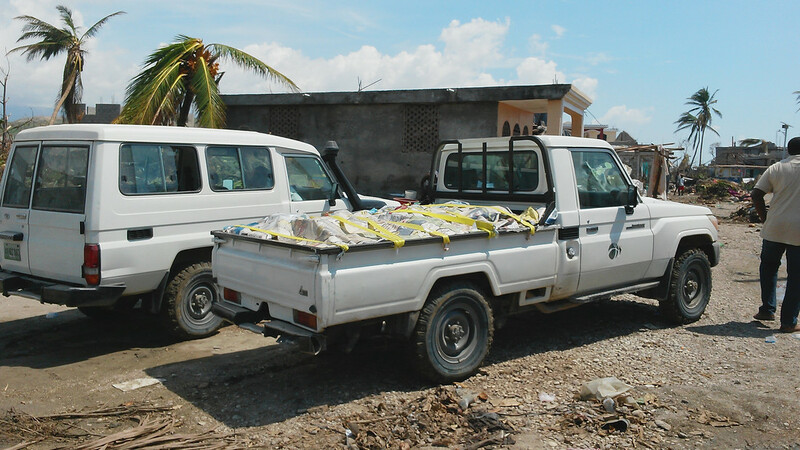 Local teams have been distributing immediate relief aid in the form of food supplies and water purification tablets in some of the hardest hit areas. FH staff who specialize in emergency response recently flew into Haiti, hours after the Port-au-Prince airport reopened over the weekend, to lend their expertise. Plans are being made to distribute rebuilding supplies and water filtration units, in an attempt to alleviate an anticipated cholera outbreak. Other hopeful plans include various cash-for-work or seeds-for-work programmes, which could help unite and mobilize local community members in the relief and repair efforts, as well as generate income or agricultural supplies for their families. 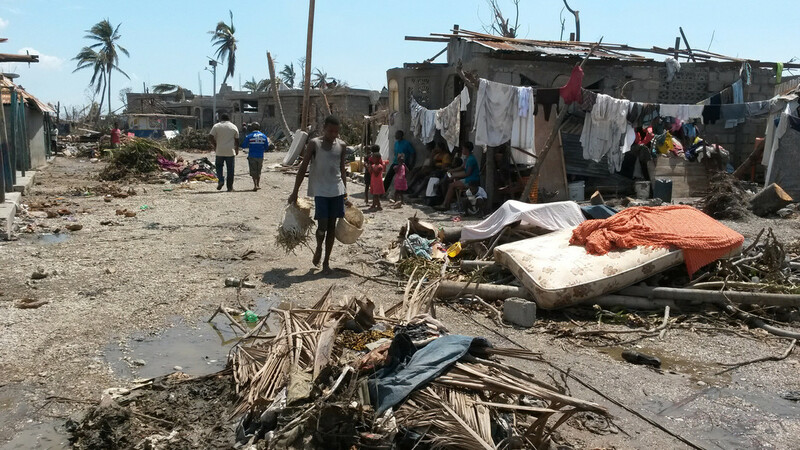 It is going to be a long recovery for many families in Haiti. 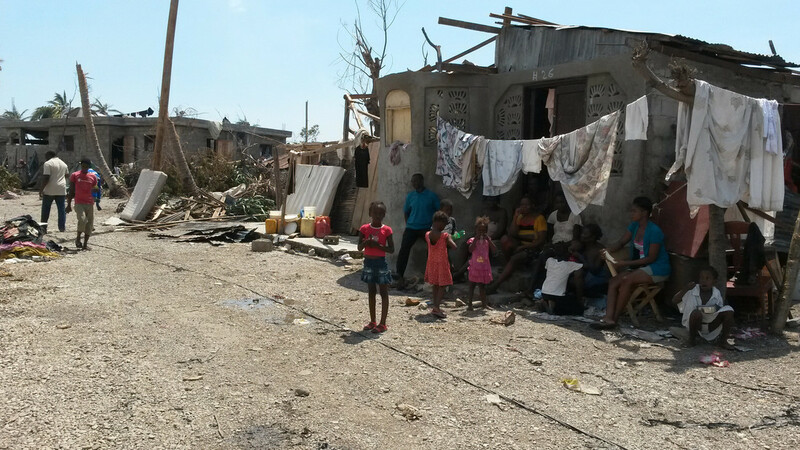 Response from Canadians, in the form of donations, prayers, and more has encouraged the hard working FH Haiti team and the children and families that are starting to pick up the pieces of their lives. Help us respond to the urgent needs of these families and their children. A FOOD FOR THE HUNGRY TRUCK DELIVERY MUCH NEEDED SUPPLIES TO FAMILIES IN NEIGHBOURHOODS FLATTENED BY THE HURRICANE. 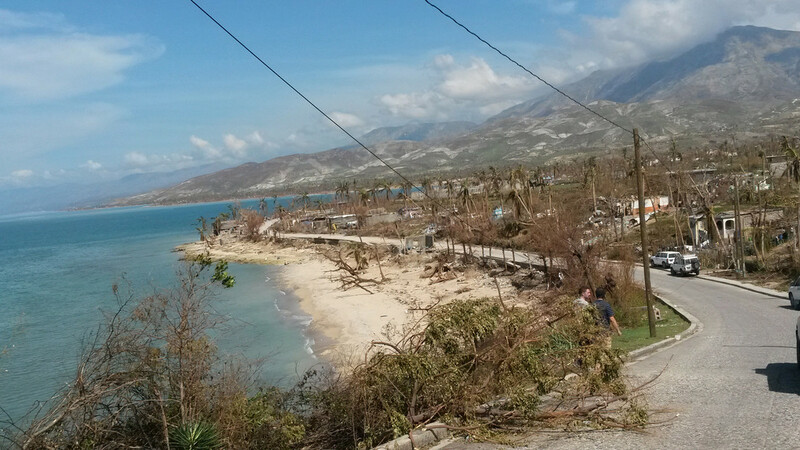 THE DEVASTATION IS ALL TOO STARK ALONG THE HAITIAN COASTLINE.